In recognition and celebration of International Women’s Day, we spoke to two Bell employees who are active mentors and motivators both at Bell as well as in the community. 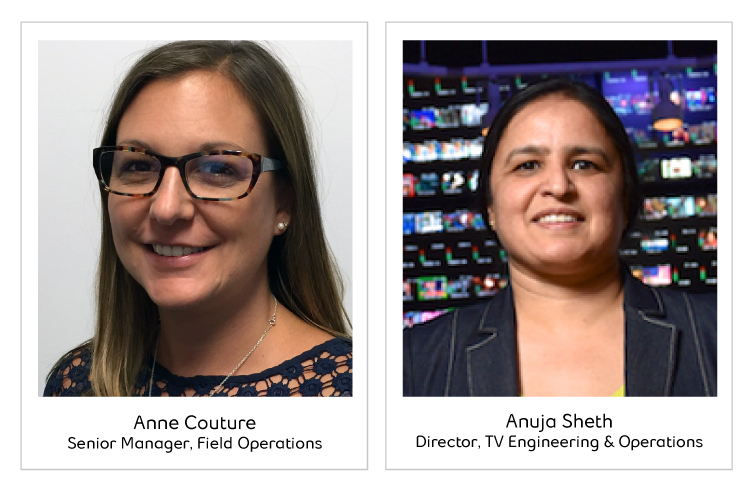 Anne Couture, Senior Manager, Field Operations and Anuja Sheth, Director, TV, Engineering & Operations share career journeys and insights. Anuja Sheth: I grew up in a small mining town in the southern part of India. I studied Electronics and Communications Engineering. After a few years of working, I did my MBA at the University of Toronto’s Rotman School of Management. I started at Bell in July 2007 as a Manager for Applications and Vertical Data Devices testing on the Wireless Technology team. My husband and I came to Canada in 1998 as new immigrants and have called Canada home ever since! We have two sons and live in Markham. Anne Couture: I’m from a little town in Northern Quebec called Chicoutimi. I came to Montreal to do my Accounting Degree. I am a Chartered Professional Accountant. Right after school, I joined Bell in Finance. I enjoy working with numbers; moreover, I prefer to use numbers to manage Operation functions. In 2004, I had the opportunity to lead a team in Billing and I loved it. I’ve worked at Bell for 17 years! AS: As Director of Video Engineering and Operations at Bell, I lead the team responsible for engineering and operations of all the TV platforms powering Bell’s Fibe TV, Satellite TV, and OTT services. AC: I started my career in Bell Business Markets and two years ago I moved into the Field Services organization. I’m now an Operational Senior Manager and I manage the team in-charge of the workforce who creates and manages the Technicians schedule for Bell Residential Services in the Quebec market. Anne, can you tell us about the Women at Bell Steering Committee, why you’re involved and what your favourite thing is about being on the committee? AC: The Women at Bell network is a collaborative national program with a mandate to support the development, advancement, and visibility of women as leaders within Bell. The steering committee’s vision is to help women of all levels reach their ultimate potential through networking, professional development, and mentorship opportunities. I was approached to be a member through the Next Generation program, as I was on the Field Services team, which is a male-dominated part of the organization. I planned and participated in a few events because I thought it would be good for developing my network and inspiration. It was a great opportunity for me to meet other women who are on the steering committee, to have a voice at Bell, and to ensure that every woman feels like they’re able to manage their career the way they want. What actions do you and/or your team take to help drive gender parity? AS: I am a regular participant at university career fairs and panel discussions to demonstrate to young women that they have an important place in the telecommunications industry. Last year, I spoke on a panel to inspire women in STEM to ‘engineer their way to the top’ and challenge barriers that can prevent women from moving into senior leadership roles. AC: We have a goal of increasing the number of women in Field Services Management roles and over the past 5 years we’ve begun to see an uptick. With women in these roles, we see an increase in diversity in the team both culturally and functionally. You are both mentors, what advice would you give to a young woman who wants to work in your field? AS: As engineers, we tend to be comfortable in roles that are more predictable and less risky. Through training, we are expected to come up with a solution that has very little probability of failing and you are expected to have all the data needed for decision making. As you move up the corporate hierarchy; however, you need to get comfortable with risk – whether it’s taking a risk in your career or risks in dealing with a problem. You need to learn to make decisions based on what you have on hand and to self-correct as you go. AC: Work hard, show up, be confident in yourself and collaborate with your team. Anuja, how will you be celebrating International Women’s Day? AS: By reminding female colleagues they should be proud of what they do and that they should not underestimate the value they create for the organization through collaborative and inclusive leadership. AS: Mahatma Gandhi. He embodied the two key attributes I admire the most in leaders – humility and integrity. AC: My Mother. She raised me by herself and she was always independent. She taught me that it’s important to be independent and not to rely on anyone else. My first goal was to finish school, to get a good job and be financially independent at a young age. My Dad is also my role model, as he is an entrepreneur and owns a hotel. He taught me how important it is to work hard. It’s also important to ask questions and validate the answers for yourself. At Bell, there are also many women who have inspired me at various stages in my career. Bell has great women leaders at each level. What is the best advice you’ve ever received from a mentor? AS: Aim for excellence and success will follow. AC: To have confidence in myself. Everything starts there. How do you maintain your inspiration or spark? AS: I love what I do at Bell and I come to work every day hoping to learn something new. I draw inspiration and energy from both the highly-motivated team members I work with, as well as my family who have been a source of strength for me. AC: The people I work with inspire me every day. To learn more about Bell’s commitment to diversity and inclusion in the workplace click here. Interested in a career at Bell? Visit our career site.